Palm Coast is a great place to retire, that is for sure. But is that the full story? We had a reputation for high unemployment, though that's steadily on the wane. That's not the full story, either. Not even close. Other than being a lovely, sunny place in northeastern Florida, demographically and economically, Palm Coast has been positioning itself for success. So maybe it's time to shift the conversation. Let's shift it toward the talent and businesses we have in and around Palm Coast, here in Flagler County. The type of businesses any bustling city would consider itself lucky to attract. How about all the little known things WE make for consumption, locally and beyond? Products that help make Palm Coast a destination to boast of, not take shots at. After all, palm coast is a place of modest, but persistent character. The purpose of this site is to get the memo out. We want to couch any preconceived notion someone might have that might dampen enthusiasm for our coastal, balmy city by the sea. The city has only officially been around less than 20 years, and that's a fact that we use to our advantage. It's like we're always on the brink of a new century. Does your business develop or manufacture its own products here? Whether they be distilled spirits, gluten-free chocolate, or pizza squares unheard of outside the farthest corners of Rome, or, on the tech side, the next revolutionary app for that matter--let us know. More importantly, let the rest of Palm Coast know. Let the world know. Download your own "Made in Palm Coast" badge for your website. Stand in solidarity, whether you choose to do it in the shade of a palm tree, your AC controlled office, in your garage, or right out under the open sun, with your fellow Palm Coast-product-bearing brethren. Let's show everyone else not only what we're made of but also what we make. We're not New York, Los Angeles, or San Francisco. We're Palm Coast! 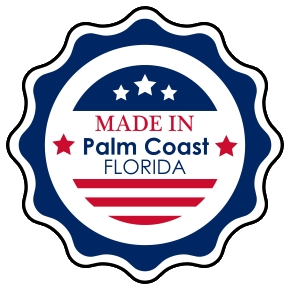 To insert the "Made in Palm Coast" badge on your website, simply copy and paste the code below to the part of your website where you would like it to appear. If you need help getting the badge on your website, come attend an Ask The Interns session at no cost. Office Divvy's Highschool and College interns and digital team members will help you do just that. Office Divvy ™ -- a Business Percolator, with a mantra of "Empowering Entrepreneurs." Office Divvy helps entrepreneurs start-up and grow. Company offers Coworking, Palm Coast Business Location and Mailing Address, High-Touch Call Desk & more. 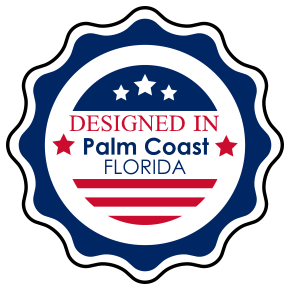 Note, extra bragging rights: The "Made in Palm Coast" campaign and websites had been envisioned, developed and crafted by Office Divvy. Flagler County Department of Economic Opportunity facilitates the expansion and diversification of the County's economic base with targeted businesses that provide sustainable employment opportunities for the Flagler County residents. Palm Coast Business Assistance Center (BAC) --a subchapter SBDC, with the mission to help grow local businesses. SCORE Chapter 87-- celebrating 50 years in 2015, Service Corps of Retired Executives (SCORE) Chapter 87 services Flagler and Volusia Counties as a nonprofit association dedicated to helping small businesses get off the ground, grow and achieve their goals through education and mentorship. Flagler County Chamber of Commerce --a highly progressive Chamber for Florida, with its mission to help the business community thrive. CareerSource Flagler/Volusia provides recruitment-related services, human resource information and training opportunities to businesses and job seekers in our community.